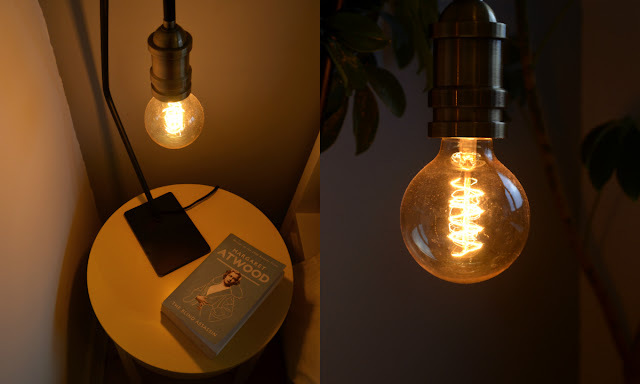 When I was planning my bedroom I had pretty clear ideas of what I wanted. My flat is a really bright space - the living is yellow, the bathroom has the world's dreamiest blue tiles, and I've got a candy striped wall in my study, so I knew I wanted a calm, neutral bedroom to balance it out. This room originally had lime green walls, so the very first step was to paint it all! I used Dulux Warm Pewter for the wall behind the bedhead and Dulux White Mist for the rest of the walls. Most of the furniture in my flat is from Ikea because I needed to buy a lot of it, and I was on a pretty strict budget. 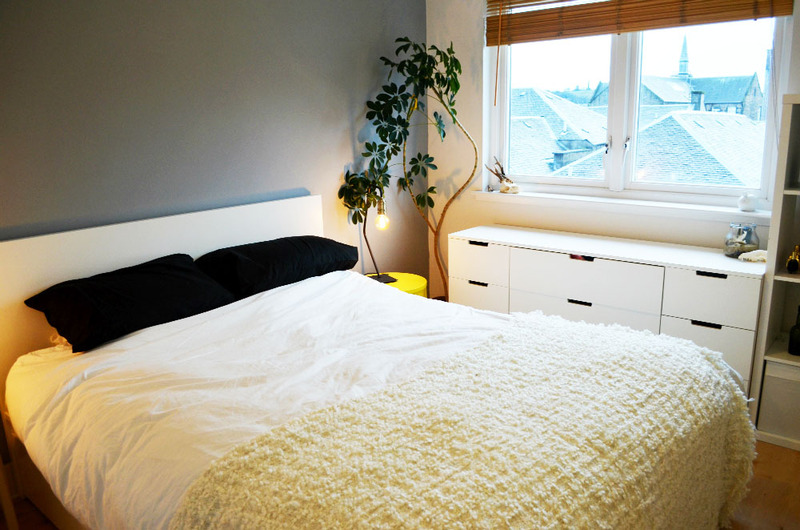 The bed is a kingsize MALM bedframe with four drawers underneath (so handy!). I was really pleased to discover that Ikea have started doing normal sized bedframes now, so I was able to buy a mattress from a proper mattress shop - I've heard nightmares about Ikea mattresses! I had a fairly narrow space between the bed and the window, so this NORDLI chest of drawers was perfect, even though it was a total pain to build. So hellish. Be warned! My flat's on the top floor, which means I have beautiful views of Edinburgh rooftops, it's so lovely! I can even see Edinburgh Castle from my window, which is something I only really thought happened in movies (or to rich people!). 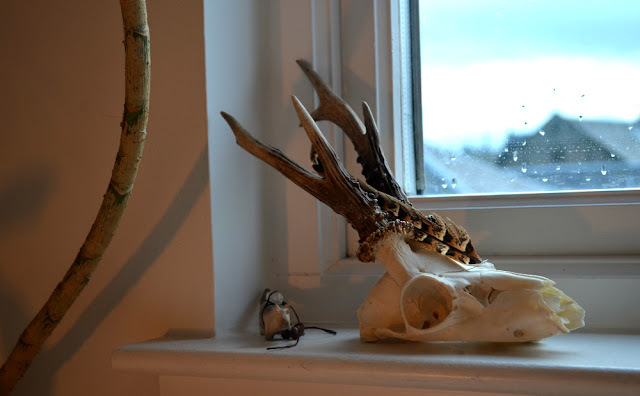 I've not got much in the way of decoration in the room apart from my skulls - I've got a roe deer and a red fox skull that I really love (I'm aware this might seem a bit weird, but each to their own). 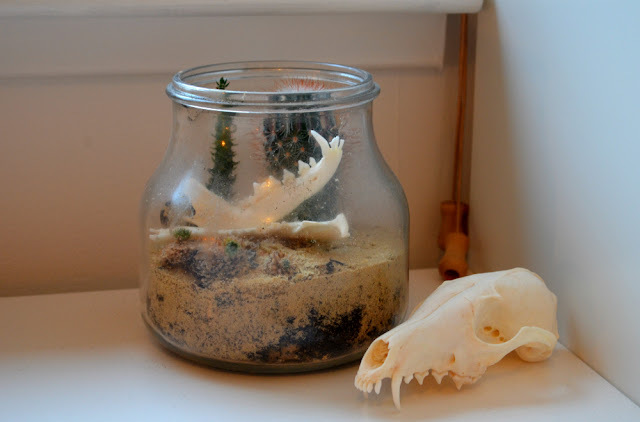 I just like the natural textures in the room - there's a tree, bones, and a little stone fox, it all just feels super calming. 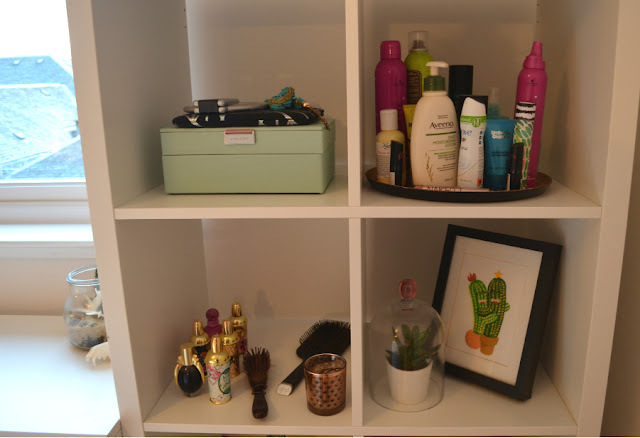 I needed a bit more storage (I've got a mirrored wardrobe in this room, but it's already full to the brim), so I bought a KALLAX shelving unit to store my stuff. I realised I was an adult when I bought a fancy little copper tray to put my bottles on, rather than just scattering them over the shelf. I'm getting there anyway!